Somalia's virtually powerless government was unraveling Thursday as a fifth of its Cabinet resigned in disgust and the administration's Islamic rivals took over the presidential palace in the capital of Mogadishu. Eighteen key ministers in the 102-member Cabinet said their government has failed to bring peace to this chaotic African nation as it emerges from 15 years of anarchy. 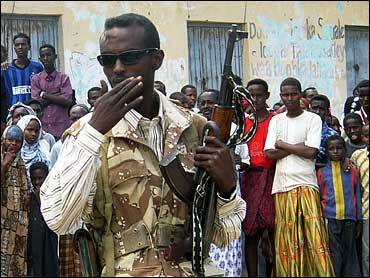 The leadership has no power outside its base in Baidoa, 155 miles from the capital. "This is the place where Somalia will be ruled from, and we appreciate your cooperation with the courts," said Abdirahman Janaqaw, a senior member of the Supreme Islamic Courts Council. Somalia has been without an effective central government since warlords toppled Barre in 1991 and then turned on each other, carving much of the country into armed camps ruled by violence and clan law.